As the summer holidays have begun, I've had a bit more money to spend from working overtime than usual. Over the past month, I've managed to accumulate a few new things worthy enough for a haul I thought I'd share today. H&M is my favourite high street shop recently. It's ideal for basics and all their clothing items are of great quality - I've managed to wear my staple H&M pieces for years without signs of wear and tear! I was looking for simple t-shirt dresses to wear with long shirts and cardigans in the summer months. I found a grey, black and striped t-shirt dress for £6.99 each. The sleeves are rolled on all of the dresses. I say dresses, but they're actually described as 'long t-shirts' on the website, so I find it a bit risky wearing them out without tights (I'm only 5"5!). 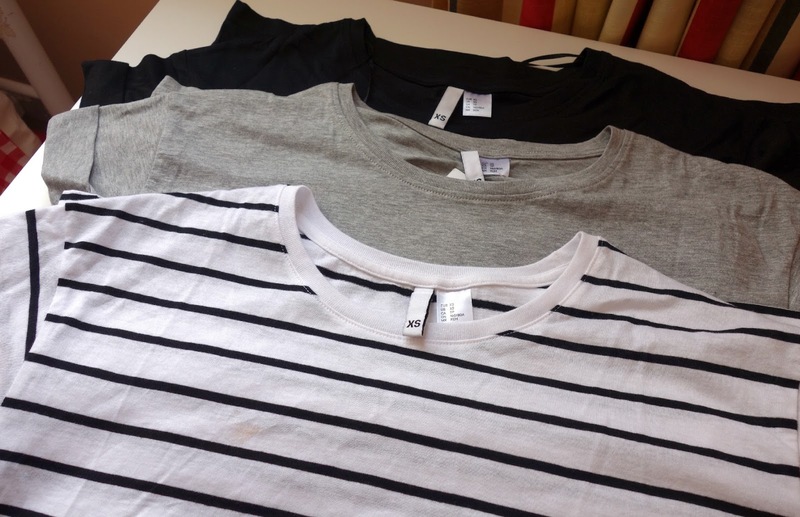 Regardless, I've been living in these t-shirts recently, mostly paired with an army print or denim jacket as it's quite chilly in Scotland to wear it on its own. I also purchased a new rucksack. Previously, I was using a black and white daisy rucksack from New Look but it was starting to look a bit frayed and worn. 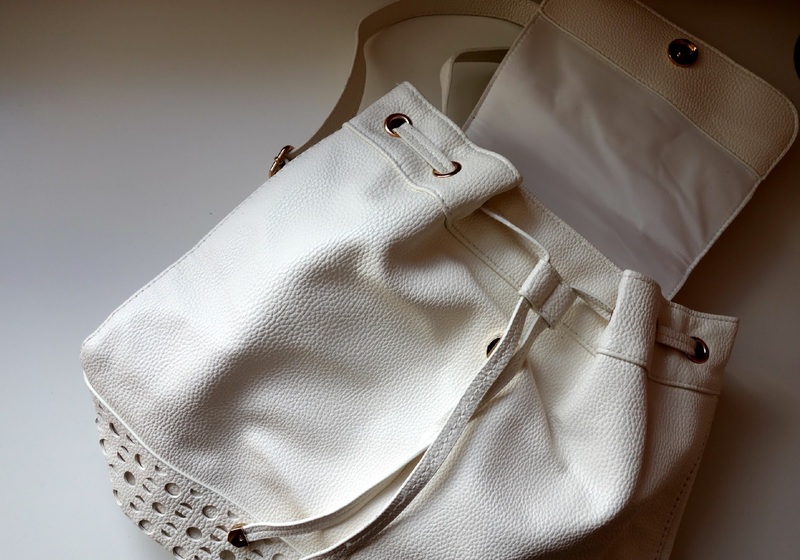 I bought this white rucksack from H&M for £29.99. The bag closes with a drawstring and a popper button so my belongings are relatively secure. 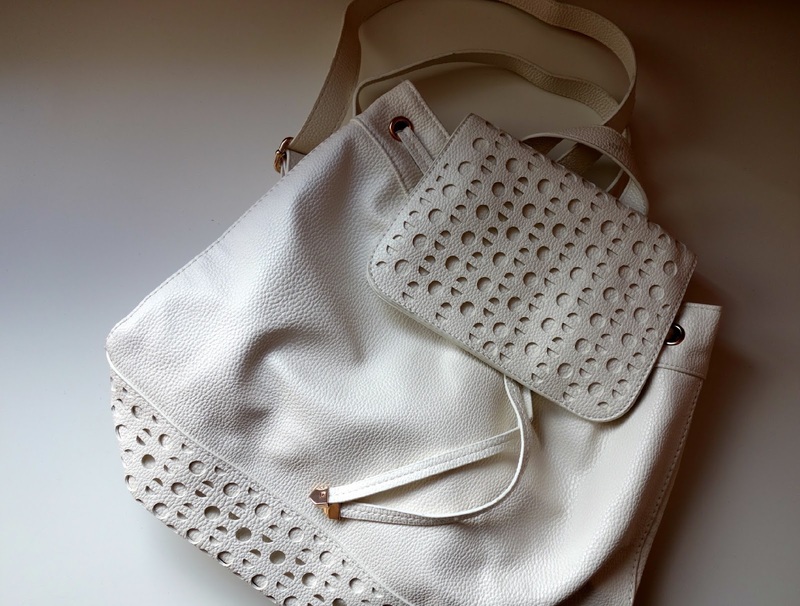 I love the cut out detailing on the flap and the bottom of the bag. Although it's a bit smaller than my old rucksack, I'm excited to wear this with some summer outfits. I was then searching for some black and white underwear. I usually purchase my underwear from Marks and Spencer, but I was curious to see what the other high street stores were offering. I'm not a huge Primark lover nowadays, but I had a quick browse in their underwear section as I had heard some friends rave about their collection. As I have quite a petite body, I find balcony bras suit me best and unfortunately I didn't find Primark had a huge range of this type of bra. However, I did manage to select a white and black bra paired with matching underwear. Each set was only £5 and I have been pleasantly surprised with the quality and fit so far. 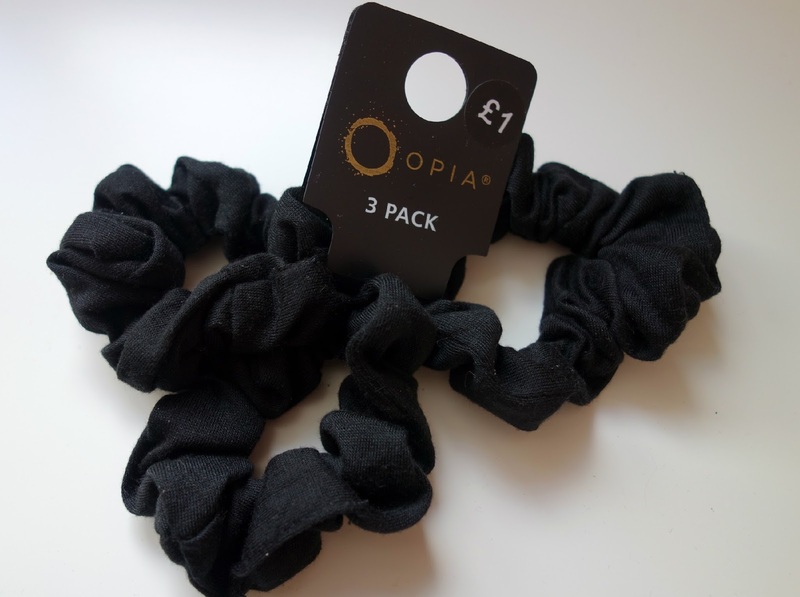 I also purchased a 3 pack of black scrunchies in Primark for £1. Finally, I popped into Boots to pick up a few things I needed. I was on the lookout for my usual pencil eyeliner (Rimmel London Exaggerate Eyeliner) and a new concealer. 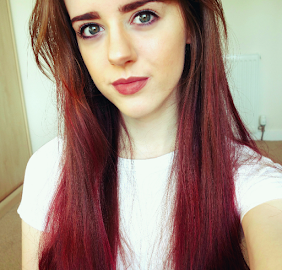 After finding my L'Oreal True Match Concealer was too yellow for my skin tone, I was after an oil-free liquid concealer in a lighter shade. I picked up the Maybelline FitMe Concealer in the shade 15 Fair. The colour is perfect and I'm really impressed with the consistency. I went into Boots the day after watching Zoella's May Favourites video and was intrigued by the Soap & Glory Whipped Clean Shower Butter she showed, so I gave it a try and it really is great for shaving my legs. My legs feel super moisturised afterwards and now I can't shave my legs without it! 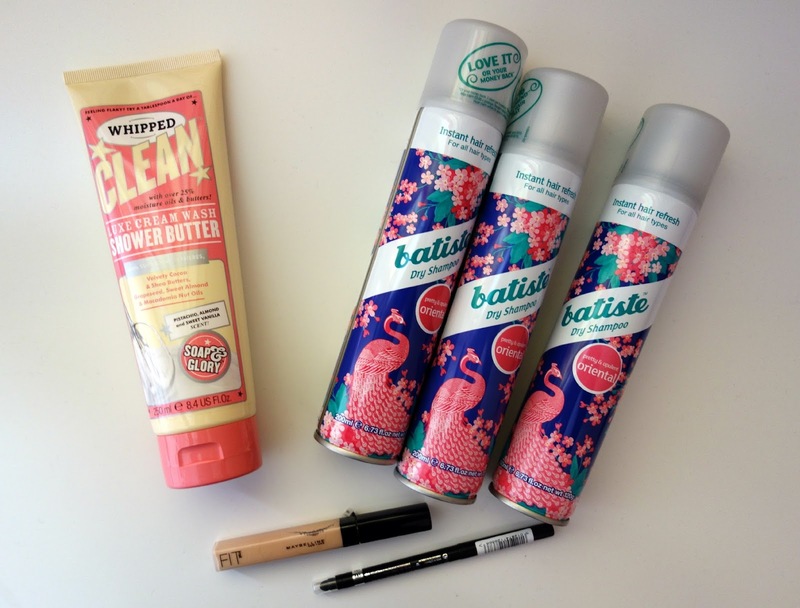 Boots have a 3 for 2 offer on at the moment on haircare, so I couldn't resist picking up some Batiste dry shampoos. My go-to scent is 'Oriental'. I work my way through the cans so quickly that whenever they're on offer I always bulk-buy. What's on your shopping wish list right now? After picking up a matte top coat in Boots a few months ago, I've been obsessed with combining it with my every day nail colours. 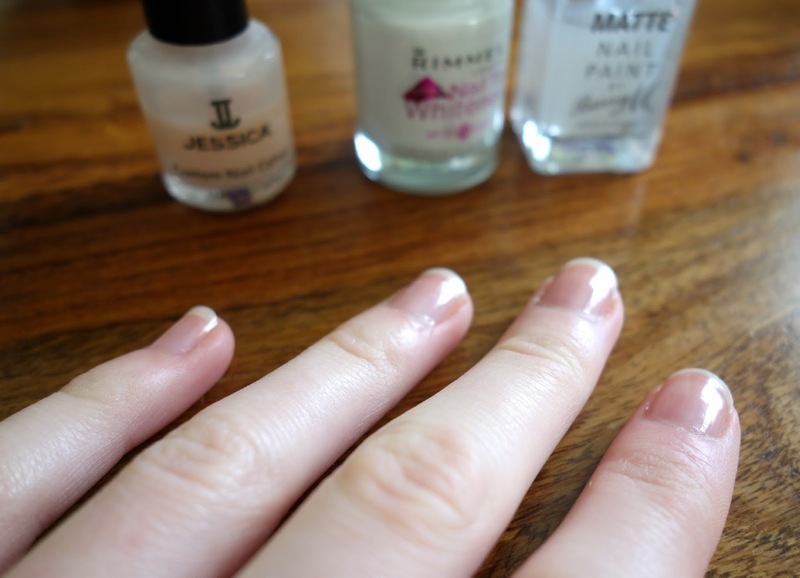 My go-to combination recently has been a simple french manicure topped with a clear matte nail polish on top. 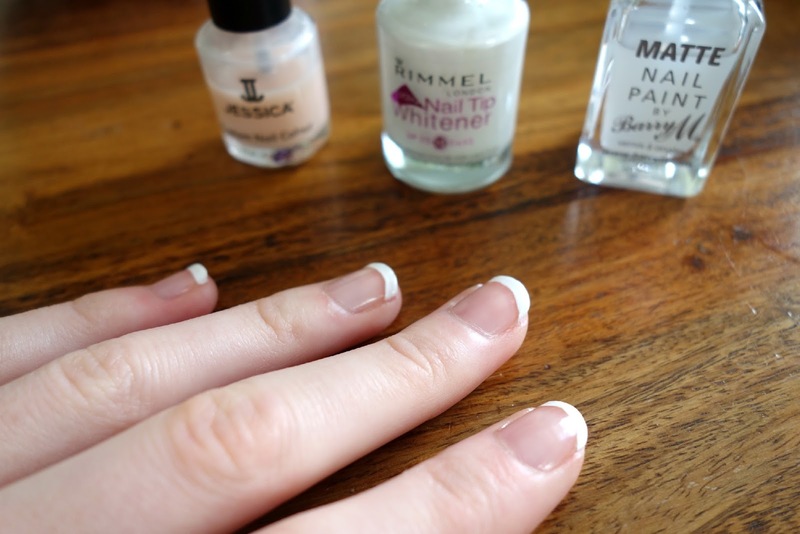 I think a french manicure is one of the best ways to make your nails feel really clean and I find the matte polish makes my nails look more natural too, rather than a glossy finish. The three polishes I used include a pale pink polish I received from a nail bar after having a professional manicure, but any natural pink close to your nail colour will do. 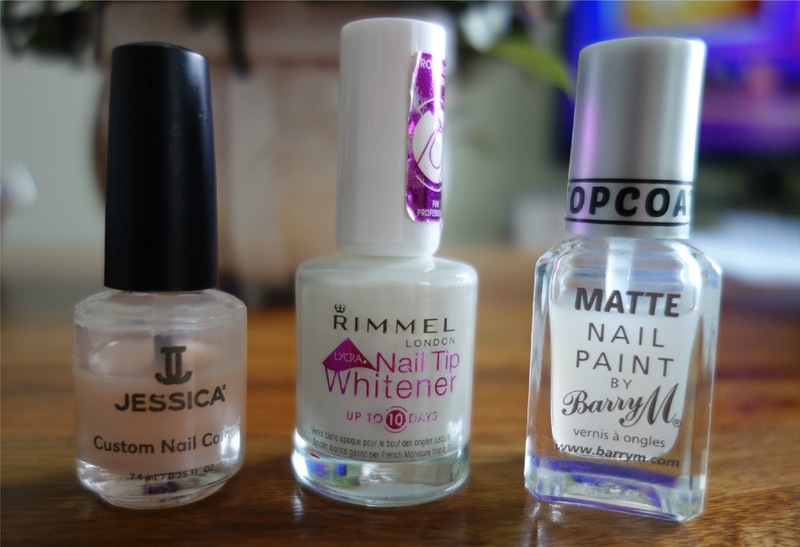 For the white tip, I used Rimmel London's Nail Tip Whitener polish and finally Barry M's Matte Nail Paint as a top coat. I had my nails filed at a spa day a few weeks ago, so I went straight into painting my nails. I started off with painting on the natural pink shade. Once the pink polish had dried, I then moved onto the white tips. I've been doing this myself for years, so fortunately with a lot of practice, I'm quite confident at doing it now. I find it easiest to drag the nail polish brush horizontally along the end of the nail. There are also french manicure guides that can be found in Boots if you find this step a little bit tricky. 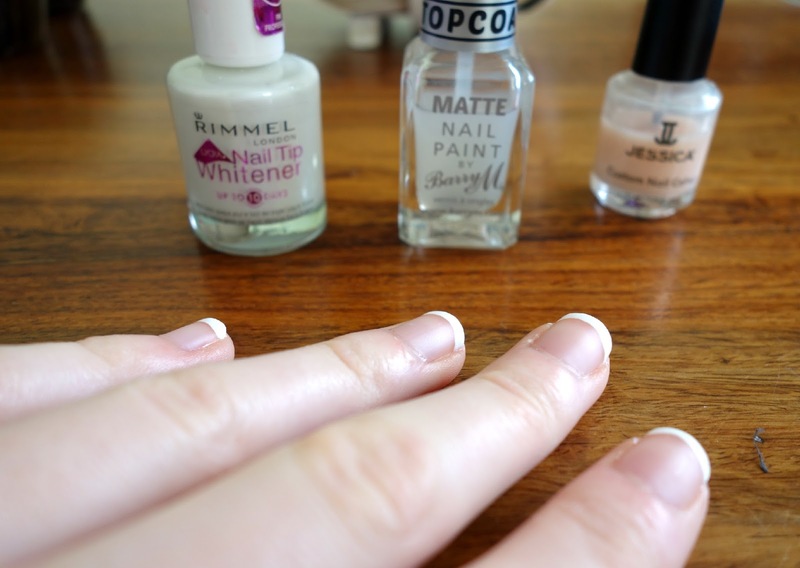 I used them in a previous french manicure blog post which can be found HERE. You may be able to notice a difference between the photo above and below. The photo above is of my nails straight after applying the white tip polish, my nails are slightly glossy from the pink nail polish. The photo below is of my nails after applying the matte top coat. The matte top coat is quite thick in consistency, so it's best to scrape off as much product as possible as the polish can bubble in places if the top coat is too thick. It can also be a bit tricky to determine whether the whole nail is coated with the matte top coat after application. I found it helpful to apply the top coat by a window during the day, with the light making it easier to pin point any missed bits. I've really been loving matte nails recently. My favourite combinations are with a french manicure and a simple black nail polish. What is your go-to nail colour?